Even if you didn't see much difference, the shorter posts did help me get slightly further on future cheapness. I think I need to go one more week with abbreviated descriptions. Thanks for your patience! Remember the '04 ALCS? When the Sox came back to beat the Yankees? That was awesome -- and the subject of the new "30 for 30" by ESPN. This season didn't turn out like we had hoped, but we did take 4 out of our last 6 games against theYanks. Either watch this show on ESPN tonight or watch it inside Fenway's centerfield with the promise of "complimentary appetizers". Program: Schumann -- "Arabesque", "Kreisleriana", and "Fantasia"
In celebration of Robert Schumann's 200th birthday, highly-regarded pianist Russell Sherman will perform three of the composer's big keyboard pieces. Sherman celebrated his 80th birthday earlier this year, so who knows how long he'll feel like giving free recitals. 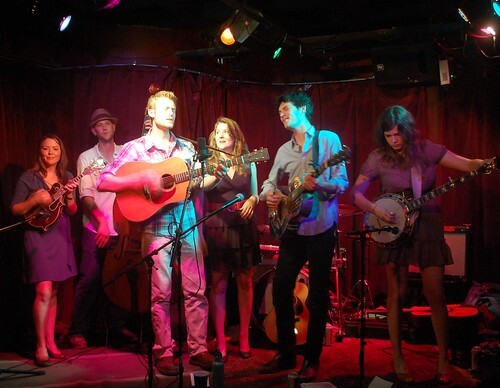 When I saw Hey Mama play a couple months ago at Precinct, they were joined by a bunch of players dubbed the "Tecumseh Strings" for an acoustic first set of country and bluegrass. It was really fantastic, and I give it a big thumbs up whoever may be a part of Tecumseh Strings tonight. If you're a picker, you're invited to join the open party before and after the featured bands. When the hat comes around, you really put some money whether you're playing or listening. If you had donated to the making of the album, then you wouldn't have to pay to get in. Otherwise, it's still a small way to support one of the best bands in town while listening to the new album and seeing the first music video that goes along with it. "Exile" producer Daniel Nicholas Daskivich will be DJing.